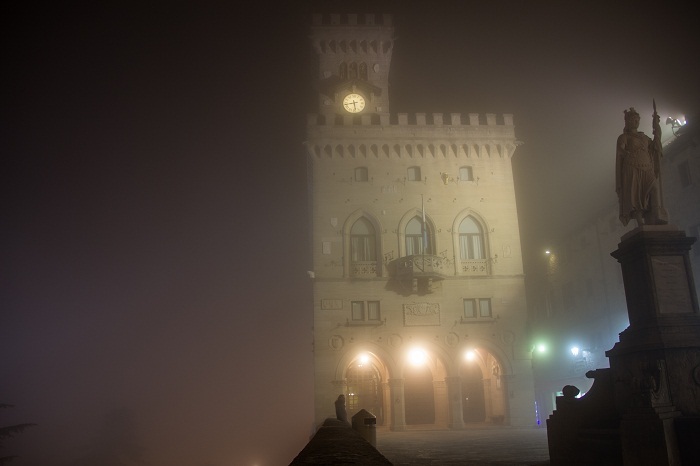 Palazzo Pubblico, or as it is the translation from Italian Public Palace, is the town hall of the City of San Marino, as well as the official building for the Government of the tiny Republic of San Marino. 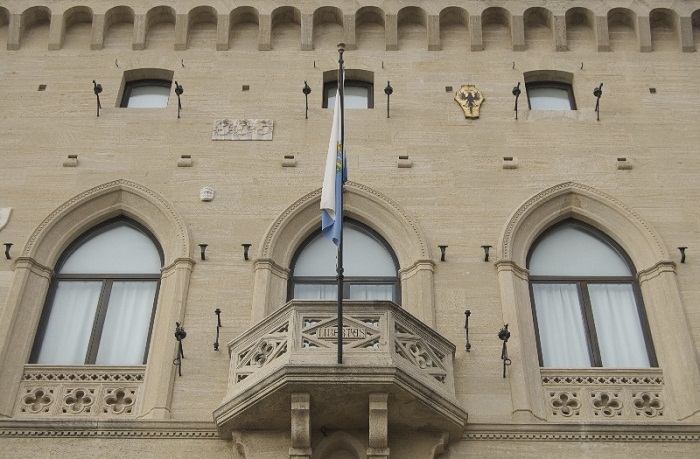 It is the building where official ceremonies of the country are taking place, and also it is the seat of the main institutional and administrative bodies of the Republic. They are: the Captains Regent, the Grand and General Council, the Council of XII, and the Congress of State. 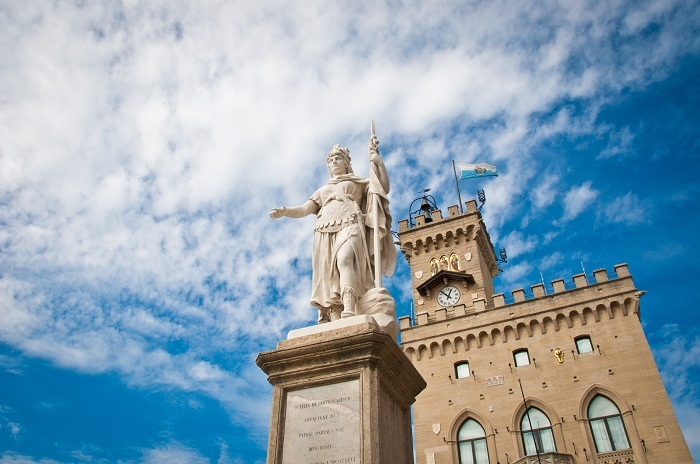 The laying of the cornerstone of the Palace took place on 17 May 1884, with the design of the Roman architect Francesco Azzurri, President of the Academy of St. Luca in Rome, and work carried out by local stone-cutters directed by the San Marino master mason, Giuseppe Reffi, utilizing stone extracted from the caves in Mount Titano. 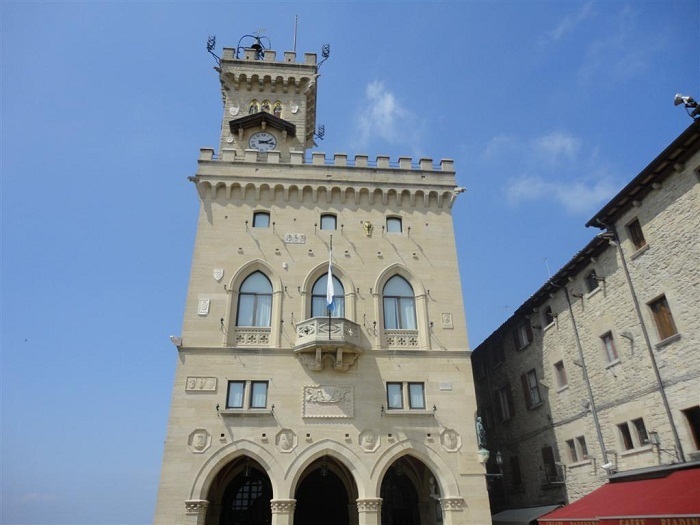 The facade is richly decorated with numerous symbols: Coat-of-Arms of the Republic and of the four Municipalities (Castelli): Serravalle, Fiorentino, Montegiardino and Faetano. 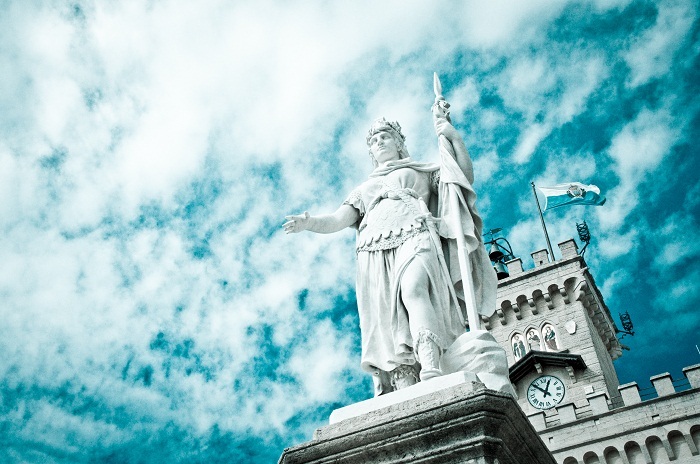 There are also the icons of the smaller localities annexed by the Republic over the centuries. It is supported by three Gothic arches, a central polygonal balcony with two large decorated windows on each side which dominate the frontal view. 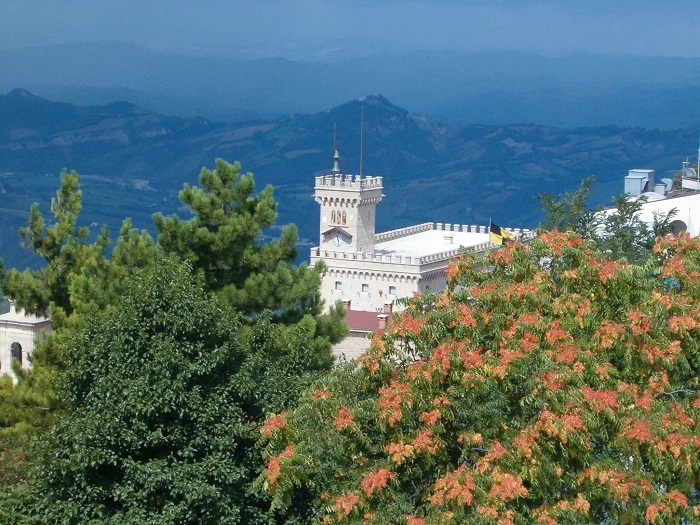 The Coat of Arms of the Republic is clearly visible between the two small windows of the mezzanine, and the bell tower which rises on the left side of the Palace has the same battlements as the rest of the palace. 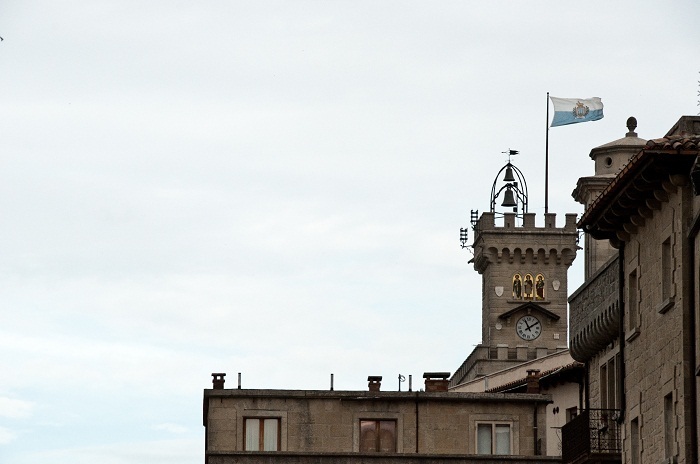 It also bears images of Saint Agata, Saint Marino and Saint Leo positioned over the clock. 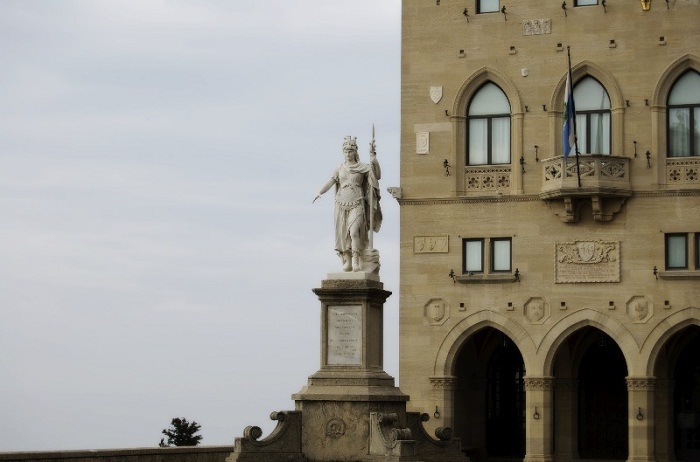 In the corner, at the mezzanine level, there is a bronze statue of Saint Marino, and under the portico, to the right, there is a marble bust of the architect Azzurri, sculptured by Giulio Tadolini. 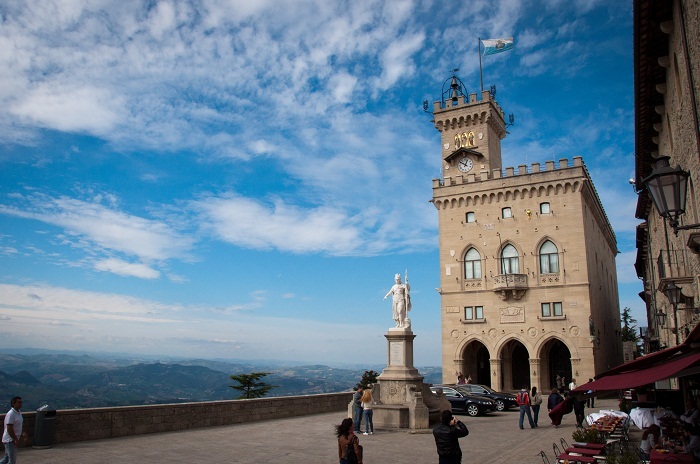 Inside the Palace, the walls of the entrance are covered with trophies, inscriptions, coats-of-arms, decorations and busts of famous men, not all of whom are San Marino citizens (for example, Giosué Carducci) but who have had an influence on the history of the Country. 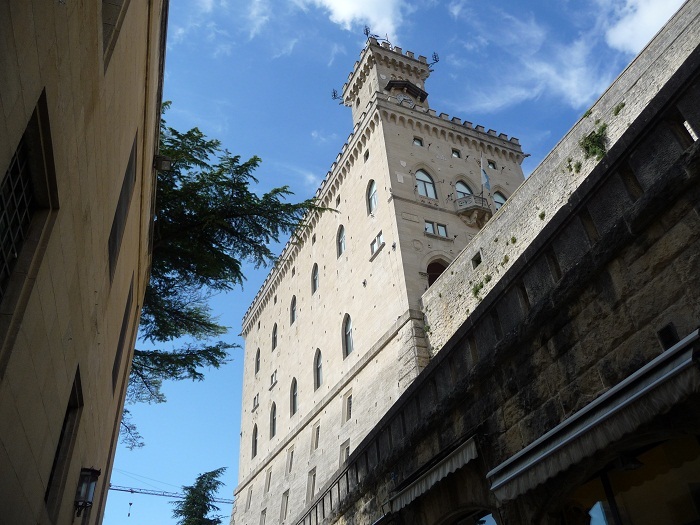 However, the real treasure which this Palace preserves is the Council Hall, located on the top floor and accessible by a stately staircase. Since 1848, the sixty parliamentarians of the Council are meeting on its benches. As one of the prominent landmarks of the city and the country, it is an important building not just for the country and its citizens, but also for every visitor who would agree right away that it definitely is quite the historical masterpiece which needs to be protected for the future generations.